How’s the weather where you are? Here in the Bruce Peninsula, we’re in the middle of a rare warm spell, something we had too little of this summer. It’s perfect dog and people weather – warm, sunny days, cool nights. The dogs seem to love it when it’s like this outside. 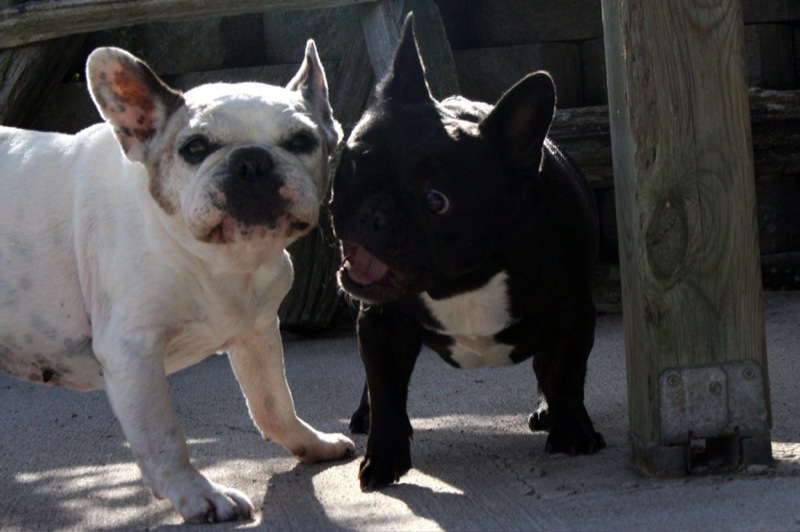 It brings out the puppy in them, and they spend a lot of time wrestling and playing, and engaging in a favorite Frenchie activity, mouth wars. Tessa might be almost fourteen, but she’s still the mouth war queen of our house. 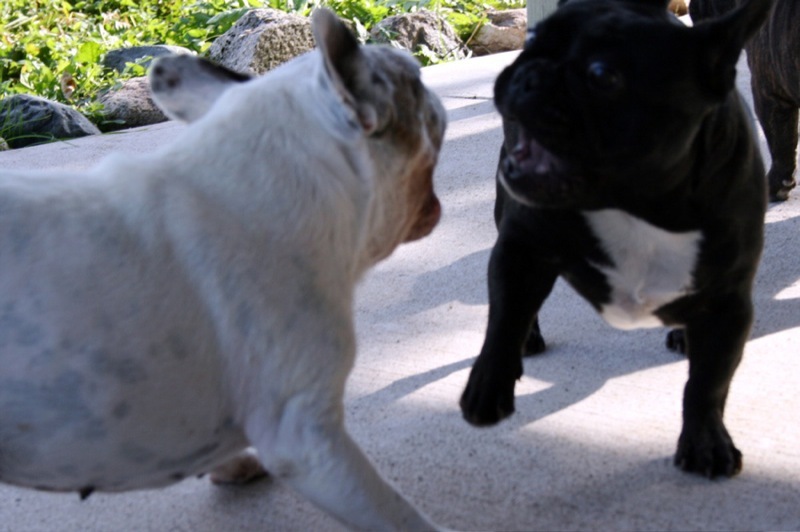 Delilah, her one year old granddaughter, is a worthy opponent, but no match for the grand dame of big mouth Frenchie wrestling. Here’s Tessa and Delilah engaging in their second favorite activity, the ‘make a stupid face and see if it sticks’ competition. Dexter spends warm days the same way he spends every other day — obsessing over his soccer ball. It’s probably the best investment I’ve ever made in a dog toy, and I paid $1 for it at the local discount store. 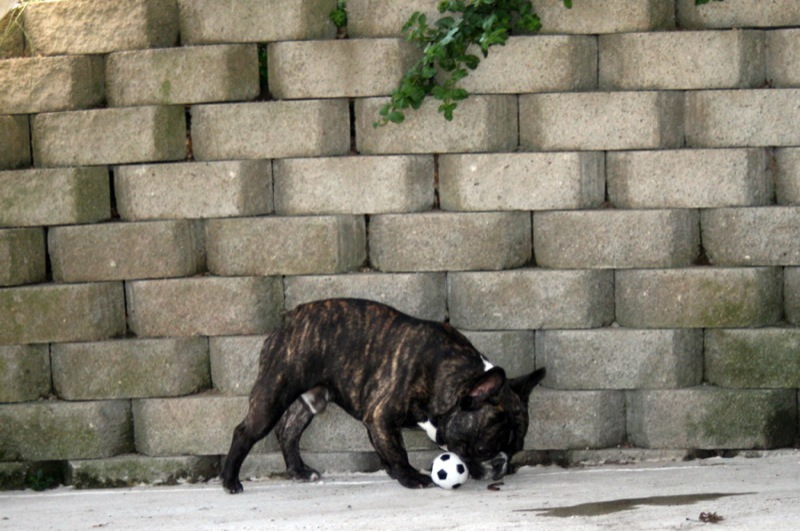 Dexter cherishes his soccer ball. He loves his soccer ball. 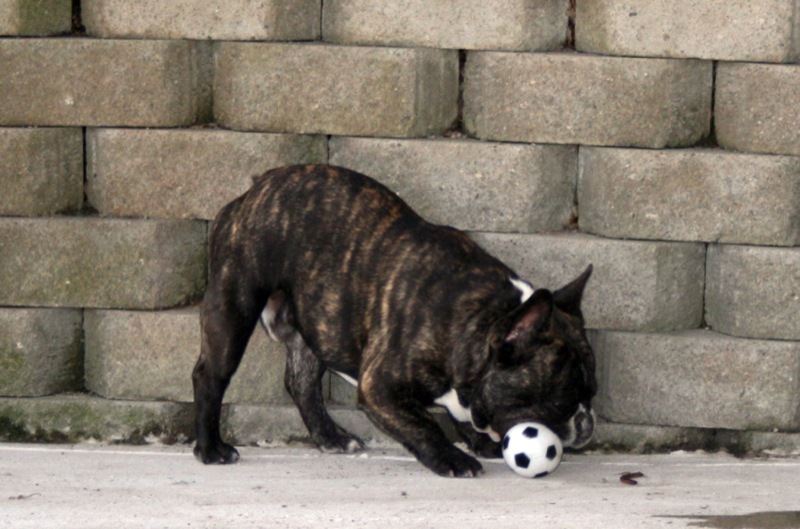 Other toys might get lost, but not his battered, dirty, squeaky soccer ball. Today he faced a dilemma — what is more important? 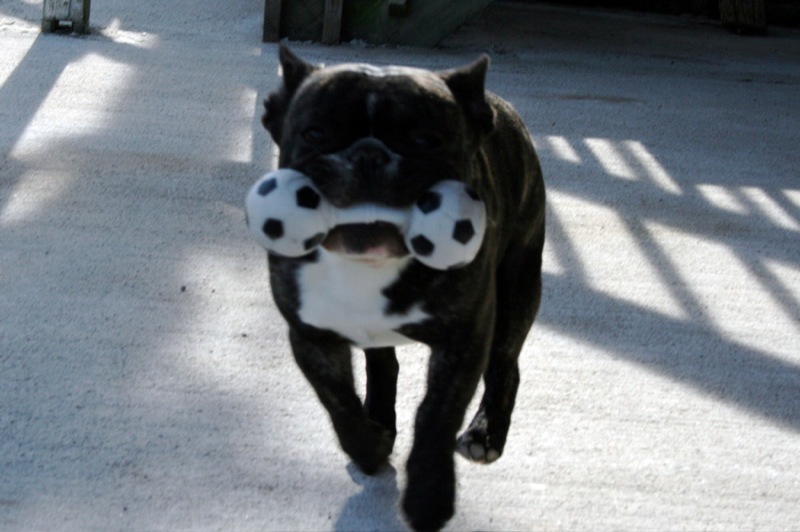 The chance to eat a worm, or the overwhelming need to keep his soccer ball in his mouth? Decisions, decisions. Looks like the worm won. And yes, he ate it. Whichever choice they pick, it ends up all over the washable pads we use to line the bottom of their ex pen (and all over each other, of course, which is why they are all getting semi daily baths). 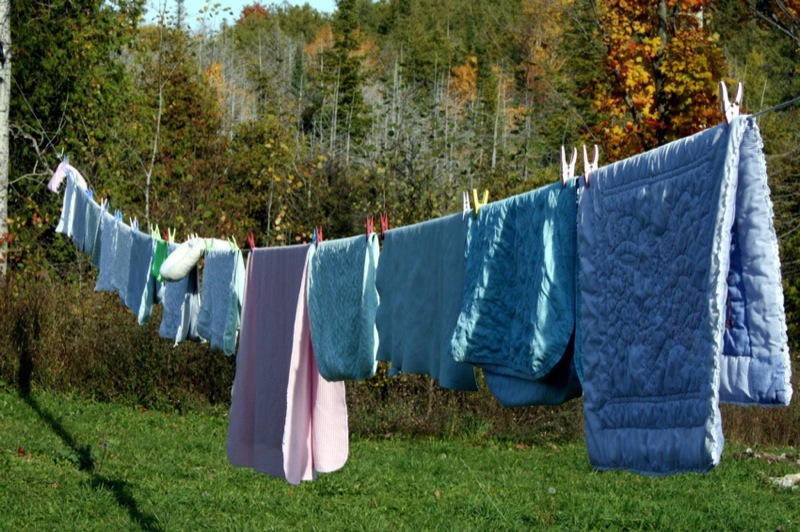 Here’s today’s laundry, drying on the line — yes, I said today’s, as in one single day’s laundry just for the dogs. My friend Lisa reminded me that this phase is the phase that lets us, as dog breeders, contemplate the idea of the little darlings leaving home without breaking into tears. At the moment, I break into tears at the thought of doing any more laundry.